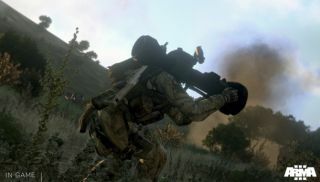 Dust off your ghillie suit and shoulder your missile launcher: the new Arma 3 community guide video has you in its sights. Produced by Arma community member Dslyecxi, the new guide deals exclusively with sniper tactics and launcher strategies in the Bohemia Interactive military sim. Dslyecxi's advice and commentary is straightforward and refreshingly jargon-free, which is helpful considering the level of complexity that awaits players new to the Arma series. Of course, we want that complexity, but it's also great to have an experienced hand to guide you, especially at the beginning. Previous videos in the community guide series include tips on team tactics , helicopter piloting , and the alpha/beta development process that has led the game to the brink of release. For a better understanding of where you might be setting up your next sniper overwatch station, be sure to check out our recent guided tour of Altis, the game's gigantic main map. Arma 3 leaves beta and officially launches on September 12.